4 June 2015 | Dark Heresy 2nd Ed. The life of an Inquisitor’s Acolyte is harsh and unforgiving. To you is given the solemn duty of exterminating heresy from the Imperium – at any cost. You’ll experience plenty of adventure along the way, but how do you keep track of all your gear, your skills, and the myriad traits and attributes that make up your character? Any Dark Heresy Second Edition player will be well familiar with the stacks of paper, the scribbled out character sheets, and the perennial question, “Who’s got a pencil?” It’s all part of playing a tabletop RPG. 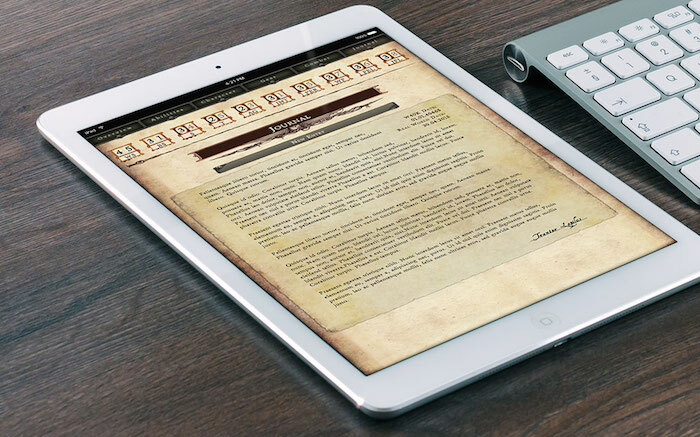 Dizelabs are proud to announce the release of the Dark Heresy Second Edition Digital Character Sheet for iOS and Android. 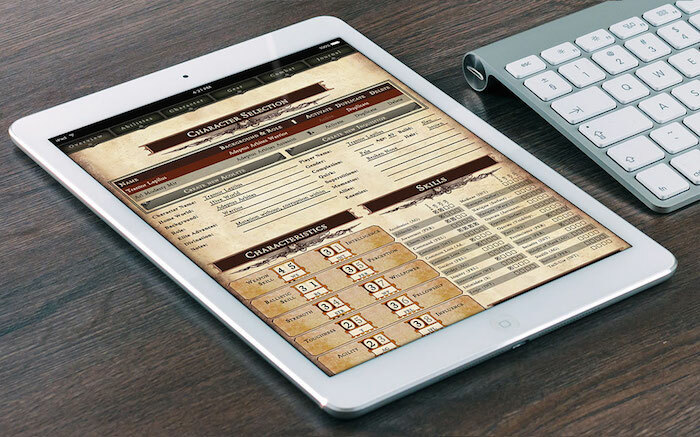 With this Digital Character Sheet, you can track your progress, ammunition, wounds, skills and anything else you need, all held in one place on your phone, tablet or other device approved by the Adeptus Mechanicus. 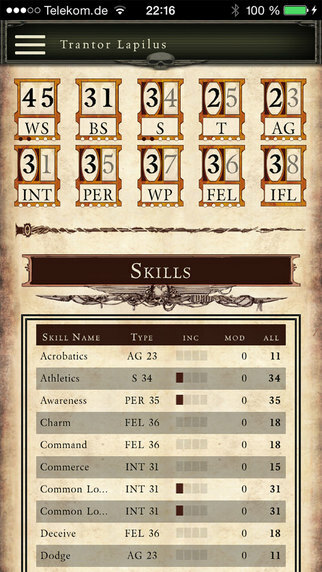 Upon opening the app, you’re greeted by the Overview of a Character Sheet that will be pleasingly familiar to all Dark Heresy Second Edition players. 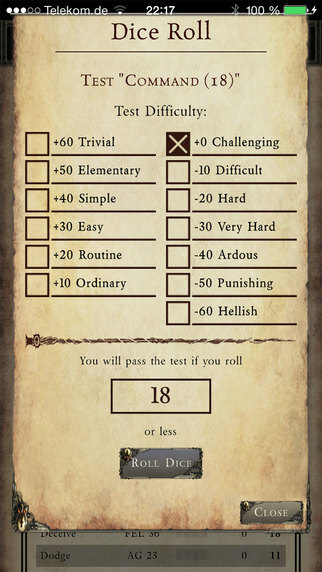 This Character Sheet is essentially the sheet at the end of the Core Rulebook, but easily displayed on your device’s screen. Of course, there are plenty of differences that set the Digital Character Sheet apart. The first difference you'll notice is that you can actually create and store multiple characters, with all of their accompanying stats, gear, and notes within the Digital Character Sheet. Whether you regularly play in multiple campaigns or you're a GM with a few key, recurring NPCs, you can use this functionality to track each of the characters you control. When you’re creating characters within the Digital Character Sheet, the app presents you with the options to make this a fun and easy process. You can randomly assign attributes, just as if you rolled your character using the tables from the rulebook. Alternatively, you can intentionally select your homeworld, background, and role, carefully considering the relevant options as you move forwards. Finally, for players with existing characters, you have the option to manually input your stats into the app, quickly bringing your character to life in the Digital Character Sheet. Once you've created your character, all of your information is neatly displayed on the Overview tab. This tab covers the broad strokes of everything you need: gear, stats, skills, talents, traits, and more. Everything in this tab is neatly summarised and easily accessible to keep the story moving, which makes it an invaluable resource when you’re navigating the labyrinthine politics of the Imperium. Naturally, you’ll want to update your character as you progress through your adventure. To help you do this, each section of the Digital Character Sheet is divided into different tabs. Each tab presents a different aspect of your character, inviting you to add more detail and update your skills, experience, and gear. What’s more, each of these tabs includes your character's stat line along the top for easy reference, even when you’re busily tracking heretics or fighting xenos. The first tab in the Digital Character Sheet is Abilities, which handles what your character can do during a game. In other words, this tab holds your character’s Skills, Talents and Traits, Psychic Powers, Aptitudes, Special Abilities, and Experience. Each of these aspects of your character can be found and edited on this tab. More personal details about your character are stored in the Character tab. This section is where all the flavorful details about your character – name, background, build, complexion, etc. – are stored. As well as these details, you’ll also find more esoteric fields like Insanity and Corruption in the Character tab. The next tab in the Digital Character Sheet is Gear. No prizes for guessing what you find here! From this tab, you’ll be able to track all your gear and anything you might pick up. In the Inventory section of this tab, you'll see all your collected items, each with an icon that informs you at a glance how many items you have of a given type – how many melee weapons, how much armor, and so on. Some of this gear carries over into the Combat tab where you’ll track your wounds, fatigue, and fate points as well as your weapon in each hand and your armour. The final tab offers a handy, built-in Journal. You can use this tab to record snippets of suspicious conversation, mission briefs from your Inquisitor, random musings, secret accusations of heresy, or whatever else might prove useful to your investigations. You'll never need to carry a separate notebook or scraps of paper again! The Dark Heresy Second Edition Digital Character Sheet is now available for purchase for your phone, tablet, or any other Adeptus Mechanicus-approved device. Always remember, knowledge is power. Guard your knowledge by downloading the Digital Character Sheet today for iOS and Android!